One of the games' great defenders, "Johnny" James was a Carlton legend. Though just 175 cm tall, he was highly skilled, tenacious and a spectacularly strong mark. In 195 games over eleven seasons (1953 to '63) he won Carlton's Best & Fairest three times (1955, 1960 & 1961) as well as the 1961 Brownlow Medal. Johnny was recruited from St Patrick's College, Ballarat. One performance of note was the day he kicked 35 goals in one game for his school (12 goals in the first quarter) in St Patrick's team tally of 48.28 316 against Ballarat High School in July of 1982. He was assigned the number 10 guernsey, and spent most of his first senior season on the half-forward flank. Though he impressed immediately with his skill in general play, his kicking for goal left much to be desired. His season tally for 1953 was 8 goals, 43 behinds! Thereafter he was banished to the backline, and blossomed into a superb defender. He was strongly built at 80 kg, and was able to hold his own in marking duels against bigger opponents. He was at his best on a back flank, yet versatile enough to drop back to the pocket or even to the key positions when required. What endeared him to Carlton fans of the day was his attacking instinct. He loved to back himself and run off his opponents, then kick long to position. He was also scrupulously fair, and always polled well in the Brownlow. His win in this prestigious award in 1961 was only the second-ever by a Carlton player. He was selected in the Victorian state team in 1955, and was a fixture in the side for six of the next seven years. In all he played for the Big Vee on 15 occasions. Champion ruckman John Nicholls, in his biography Big Nick, wrote of James; "Often his actions reminded me of a cat, because he could take freakish marks by twisting his body in the air. In his ground play he twisted and weaved, sometimes running backward out of packs, and he was hard to tackle because his strength was unreal. John was not a good kick, but his brilliant marking and ball-getting made up for this, as did his versatility." 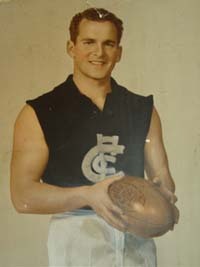 Johnny was one of the Blues' best in the Grand Final loss to Essendon in 1962. He retired from league football after the 1963 season, at the age of 29, to take on the coaching job at Robinvale for six years (1964 to 1969), taking Robinvale from an also-ran club in the early 60's to Premierships in 1965 and 1967, before retiring for good in 1970 due to a chronic back injury. John's stature at Carlton Football Club was evident to all in May, 2000, when he was named on one half-back flank in the Blues' Team of the Century. Both of John's sons also played for Carlton; Michael racked up 12 senior games in 1991, while Paul played with our Under 19 and Reserves teams. The Argus asked it's football writers to vote 3-2-1 as to who would win the 1956 Brownlow Medal. The writer's winner was John James who polled twice as many votes as the next player Fitzroy's Bill Stephen. The Argus writers got it wrong as Footscray's Peter Box won the 1956 Brownlow and Johnny James did not appear in the top 12 vote getters! Contributors to this page: Grisdesa , Jarusa , molsey , Bombasheldon , blueycarlton , PatsFitztrick , WillowBlue , true_blue24 and admin . Page last modified on Thursday 26 of July, 2018 23:28:21 AEST by Grisdesa. 1975 Rd 4 - Records fall at VFL Park. 1989 Rd 5 - Dorotich, McKenzie & Kennedy.